Oring testing helps you to choose between different products to find the most suitable product for a specific situation. ERIKS has accomplished a worldwide reputation within rubber parts, Orings and Oring testing and can help you with all possible challenges. 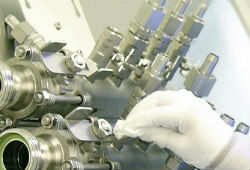 Within the field of rubber and o-ring testing, ERIKS is leading for practical all industries. Different industries and different situations often require different products, so they have set up an Oring testing lab to make sure the products first the recruitments of the industries. Besides testing existing materials, the Oring testing lab is also used to develop new products design for a specific situation. In the oring testing lab ERIKS is also able to simulate specific conditions from a particular industry, to see if the product is suitable for the conditions. If your have any questions about the possibilities fill in our "ASK ERIKS" form on the right. Questions about the Oring testing? For more information about our Oring testing lab, please fill out our "ASK ERIKS" form on the right and we will help you with all your questions.